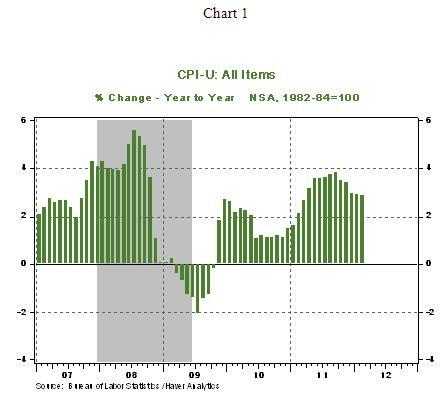 Essentially, overall CPI is trending down (see Chart 1). However, the geopolitical/nuclear situation in Iran suggests that the specter of higher energy prices will remain on the radar screen in the near term. The core CPI, which excludes food and energy, moved up 0.1% in February after a 0.2% increase in the prior month. Lower prices for apparel (-0.9%), recreation (-0.1%), airplane tickets (-0.1%) and a contained owners’ equivalent rent (+0.1%) helped to trim the core CPI. New cars (+0.6%) posted the first gain since June and medical care costs rose 0.6%. On a year-to-year basis, the core CPI moved down to a 2.18% increase in February vs. a 2.28% gain in January. 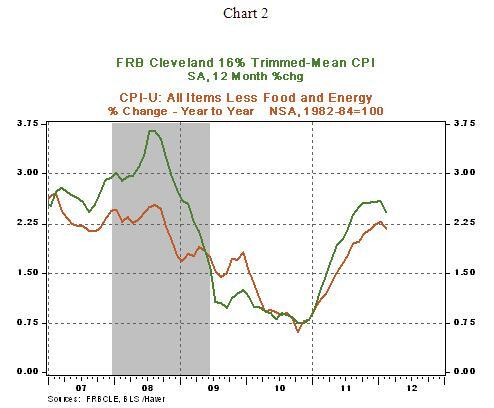 The Cleveland Fed’s Trimmed-Mean CPI rose 2.4% from a year ago in February vs. a 2.6% increase in January. The decelerating trend of these inflation measures is supportive of the Fed’s accommodative stance. The elevated unemployment rate and depressed conditions in the housing sector are the two areas of concern that will keep the Fed leaning toward providing additional support to the economy. But, it is unlikely to take action until evidence of faltering economic conditions is available to justify a new round of monetary policy easing.